Packo trapping Hannah's hair in a school locker. Susan telling Helen and Cheryl that she's celebrating being offered a spot in the teaching pool – and she'll be spending time with the local theatre company too. Philip worrying about losing his hair! Susan telling Annalise she ought to come along to the local drama group. Billy is talking on the ‘phone as Libby prods him with a broom handle! She gives that up and goes and turns the TV channel over. Mal snaps that he was watching that. Karl interjects to tell everyone to settle down. Susan is looking at a script from the theatre group and comments that they've included the lyrics for her audition piece but there's no music. She sits down at the piano, deciding to make up her own tune. As she strikes some notes, Mal interrupts and tells her that she's trying to watch TV. Libby adds that she's trying to do her homework. 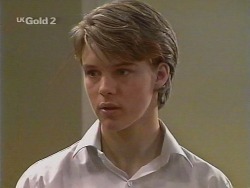 Karl chips in that after all that racket from next door last night, *he* could do with some peace and quiet too. Susan, however, tells him awkwardly that she forgot to mention that she's going to start tutoring some music students again: the first one's tomorrow afternoon! Hannah takes a jar of chilli powder out of the spice rack and sniffs it. 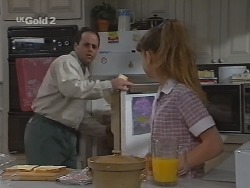 Helen catches her and asks her what she's doing, and Hannah tells her quickly that it's for Home Economics tomorrow. She puts the jar in her bag. There's suddenly a knock at the front door. Philip and Hannah both run to get it and Philip wins! There's a package for him, which he signs for. He and Hannah then head into the kitchen and Hannah opens the package. She removes a bottle containing Hair Growth Revitaliser! Hannah asks her father angrily why he's so worried about his hair all the time. 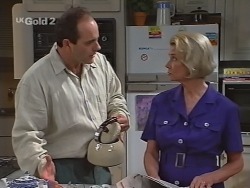 She cries that he wants Molly to think he's young; he never cared about being bald when he was with her *mum*. She runs out, upset. KEIRAN: A vote for me will be a vote for you because it's your interests that I'm really interested in. STONIE: I just reckon it would be great to have a School Captain that's not a top student or great at sports or anything, ‘cos he knows what the ordinary kid wants, and I think I could do a lot of good, and I'd be real proud and so would my family. Everyone applauds! Brett smiles at Libby that he thinks Stonie might be able to pull it off; he reckons he's genuine! SUSAN: Oh, I've got three there. ANGIE: Yeah, I know. Kevin's Billy's minder! SUSAN (astonished): Kevin is Stonefish...? ANNALISE (adds): What – you're Stonefish's *mum*?! ANGIE: Yes! You know him? Annalise just gives her a look! Angie goes on that it was Kevin who inspired her to be there by running for School Captain: she thought that if he could do that, *she* could follow *her* dream. Hannah is alone in a classroom when Packo and Danni come in, talking and realising Brett has welched out of writing speeches for both of them. Hannah tries to run out, but Packo grabs her arm and stops her. Danni tells her to leave Hannah alone. She and Packo walk out to sign up votes from the basketball team, Packo leaving her schoolbag on a desk. Hannah quickly goes into it, removes the lunchbox in there, takes the jar of chilli powder out of her pocket and starts sprinkling the contents in Packo's sandwiches! 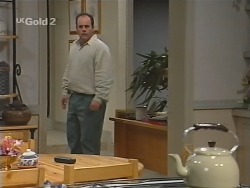 Philip joins Helen in the kitchen and tells her that that was Molly on the ‘phone: he's invited her over for a meal tonight. Helen comments that he'll need to go shopping, as their supplies are rather low. She adds that she'll take Hannah to the movies. Philip insists that he and Molly are just friends; they don't need people scurrying away. Helen, however, says she thinks Hannah is insecure; she doesn't think she knows what to make of Molly. Philip just insists that Molly is a nice lady, and as soon as Hannah realises that he's not trying to replace Julie, she'll probably like her as much as *he* does. Brett is telling Stonie in a classroom that with politics, it's not *what* you're selling, it's *how* you're selling it. He grabs another student's glasses, puts them on Stonie's nose and tells him that he looks intelligent! Libby grabs the glasses back and returns them to the boy they came from. Packo and Danni come in and Packo takes her sandwiches out of her lunchbox. She bites into one as Hannah watches from out in the corridor. Packo suddenly starts coughing violently and she runs out. Brett asks Stonie if that's really the effect he wants on the voting public! Annalise is auditioning for the part of the princess in the theatre pantomime. When she's finished, the other people there applaud. Angie and Susan then audition as well. Marjory tells them that they're very good; who would have thought that little old Erinsborough would produce such evil villains and beautiful princesses! Brett is telling Stonie that they have to convince the voters that he has a multi- faceted personality. Stonie points out that everyone *knows* him; it's no use trying to convince them he's someone else. Brett tries to tell him that making them think he's someone else is their only hope. Stonie, however, retorts that if he's going for School Captain, he's doing it *his* way, as *him*. Hannah runs into the kitchen, where Philip is making a sandwich, but she crinkles her nose and asks what the smell is. Philip admits that it could be his hair ointment – but he'll wash it out later. He then tells Hannah that he's invited Molly over for dinner; he thought they could have a rug picnic. Holly mutters that that's really dumb. Philip tells her tersely that she'll be there, and she and Molly will get on like a house on fire. SUSAN: A disembodied head imprisoned in a box on Toejam's mantelpiece. Annalise mutters that she'll be laughed off the stage. Packo is sitting at the Kennedys' piano, muttering to Mal, Libby and Billy that you cannot dump a ton of chilli into a person's lunchbox in a room full of people without someone noticing something. Libby, however, tells her to give it a rest – they didn't see anything. Susan arrives home and says she's sorry she's a bit late. She tells Packo to run through some scales, so she can see where she's up to. She then tells Billy, Libby and Mal to go to their rooms. Packo starts her scales – and she's very good. Billy turns and stares at her, looking suddenly impressed. MAL: He's got the hots for Packo! LIBBY: What happened to Nicole Cahill?! Karl declares that music lessons will continue, the meeting is closed, he's hungry, so what's for dinner?! MOLLY: What was in that drink? PHILIP: Did *you* do this? Did you? DID YOU? Hannah just yells at him to get Molly away, and she runs off to her room.